The Royal Arch takes matters further and can be seen to be the superstructure that makes all that has been presented complete and perfect. The ceremony in the Royal Arch is colourful, thought provoking and uplifting. It is based upon the Old Testament legend of the rebuilding of the Temple and invokes, simultaneously, sensations of humility and our dependence on our unseen creator. 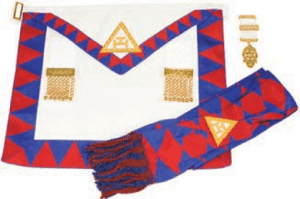 The Royal Arch makes good the promise of ‘recovery’ when what is lost in the Third Degree of Craft Masonry is revealed in a fascinating ceremony. Progress through the Royal Arch completes an individual’s journey through pure antient Freemasonry. Craft Masons are, therefore, actively encouraged to become members of the Royal Arch in order to further develop and enrich their understanding of Freemasonry. Indeed the RW ProvGM encourages Master Masons to join the Royal Arch only when they are ready to do so but before joining any other Masonic Order. Members of the Royal Arch are known as “Companions”.The word Companion is derived from two Latin terms, meaning someone with whom you shared your bread, was one who could be trusted with your life; it suggests a higher affinity than that of a brother. It is a particularly apt description of a member of the Royal Arch, who has a duty to support and encourage his Companions and to attain a high standard of his conduct in his personal life. New Members very quickly discover why we say the desire of all Royal Arch Masons is to “please each other and to unite in the grand design of being happy and communicating happiness”. When a mason is entirely comfortable with his Craft Masonry and its ethos. The interval between becoming a Master Mason and his exaltation into a Royal Arch Chapter is, however, a matter for each individual and will largely depend on his circumstances and readiness for its teachings. Early application, however, provides greater opportunity to give him the option of just sitting back and absorbing the full meaning of the beautiful ceremonial and its teachings before taking a more active participation in office. A mason is not restricted to joining the Chapter that may be associated with his Lodge; he will be made welcome in any Chapter of his choice. Indeed, many Brethren choose to join a Chapter un-connected with their Lodge, or even in a different Masonic Hall, as this affords them the opportunity to develop and widen their relationships with other masons, thereby enhancing the companionship and happiness Royal Arch masonry offers. Apart from the Installation of each of the three Principals, there is only one: Exaltation, when a new member is admitted to the Chapter in a most impressive, colourful and moving occasion. Convocations are usually followed by a meal at the Social Board. Chapters, like Lodges, are encouraged to share ritual to reduce the work-load on any one member, especially new members. Three items; an apron, sash and breast jewel, all of distinctive design. The breast jewel is worn by Freemasons who are members of the Royal Arch at their Craft meetings to evidence to brethren their membership of the Royal Arch. The total cost of the regalia, new, is around £65. Chapters often have used regalia at a much-reduced cost as, in some areas, a register is held of members who have such regalia for disposal. There are minor changes to all three items needed on becoming a Principal of your Chapter. What next / How to join?